03 | September | 2007 | Let me be frank! As a firm believer that iPod freaks are…well…freaks, I’m so very glad I stumbled onto a site called Anything but iPod. So I’m glad I have a Creative Zen Micro, old school, without color screen and with a 4gb hard drive. I’d like to upgrade it but really, it does the job for me and I don’t need something to show off pictures, because my N95 does the job for that. Bigger screen, and it can take the pictures and play music as well. In fact, if I don’t want to take my Zen with me I just listen to music on my phone – I put in a 2gb Micro SD card and can fit it with a 4gb card if I wanted. First thing I did on the Anthtingbutipod.com site? Click the link on the right for the Zen. First post I looked at? How to upgrade the micro hard drive to a 16gb Compact Flash (CF) card. Step-by-step instructions, with pictures, parts lists and firmware file links. Can’t beat it! Looks like I have another project to put on my ‘to-do’ list. I am sick of hearing about Diana, Princess of Wales. I am so tired of hearing about Diana and her death. Yes, she is perhaps the most famous person to have died in a car crash in the last 25 or so years, but NO ONE else I know at work is the least bit interested in the concerts (which just happened a month or two ago! ), the specials, the articles, the papers, the magazines, the books, the clothes or anything at all. So why does it come up every month? Does anyone else care less than me and pretty much everyone I know? At the time Di was really active with her good causes I was thinking ‘that’s great, good job’, but since the car crash it’s been all about the supposed conspiracy, the controversial books and more. 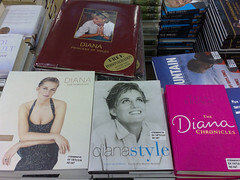 There’s a whole industry of Diana that has been built up and shows no signs of slowing. If, tomorrow, Paris Hilton ran over Lindsay Lohan while Britney held a gun to her head and then the car went over a cliff, maybe that would dominate the news and we could all get sick of that, but eventually things would come back around to Diana. Just so you know, I’m not heartless. I give to charities at work – at least a few quid a month on average, plus I’m a continuing member of the National Trust & English Heritage. I”ve donated to PBS. I used to be a member of the Sierra Club, the Nature Conservancy and a couple other environmental groups. I give to a different charity every month for a year – the RSPCA and Trust for the Blind in the past. I buy the RSPB pins and things. I shop at Oxfam. I donate my clothes instead of selling them. I buy fairtrade whenever possible. I’m also considering a trek on the Coast to Coast path for charity.